Where do these Wednesdays fly? 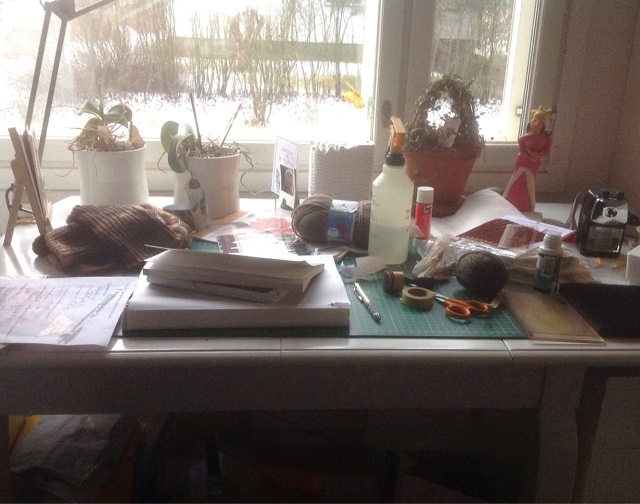 Once again I'm sharing my desk for woyww and if you don't know what that means, check out the link and join in the fun! My desk is a mess, photo taken Tuesday afternoon, just to have some daylight for a change :) Besides we got our first snow... just an inch here (and it's gone by now), but during the weekend there were 50000 people in middle Finland without electricity, because 30-50 cm of wet snow made trees fall on the power lines! These have a nasty hole that's a bit to the side so it breaks the structure that gives the heal it's shape... and I can't even get the satisfaction of whining at the person who let them go that far, because they happen to be mine! The one on the right was just thinned out, and has been reinforced, the one on the left is under work. Luckily this is already the last pair in my pile, I can move on to checking those darn tests! I was just going to say how exciting about your first snow but after reading on it can't be much fun for those poor people without power. Good luck with your tests and the darning. You could be needing those soaks if you get more snow. You're right about the darning..much quicker....even if it has taken the arrival of winter to make you do them. I totally get that! 30cm of snow is sudden and a lot, those poor people without power..i think that would be misery! Good luck with the test papers, test season sure does come at a busy time! 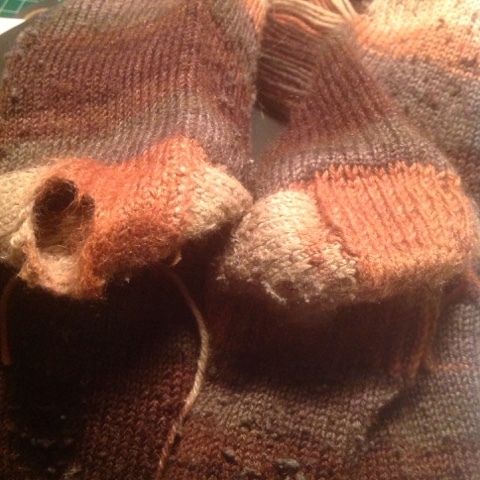 Oh that brings back memories for me....darning socks. I used to darn socks for my dad many years ago. Alas socks just tend to get thrown up these days and new ones bought....but mine aren't nice thick ones like yours. I too would darn socks if they were lovely handknitted ones like yours. Gorgeous view from your window! Have fun darning your socks! I have never knitted socks before, I can't knit very well. I could not even think about how you would start to darn a sock. Looks like a glorious view from your window.